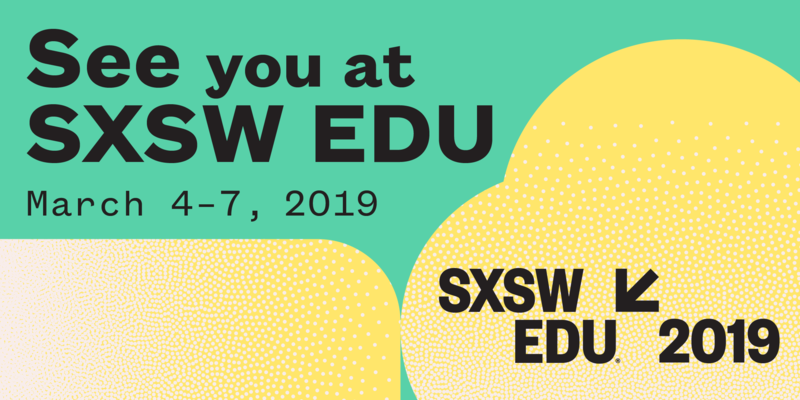 SXSW EDU 2019 is here! This week (March 4-7), forward-thinking, purpose-driven stakeholders from across the country will be convening in Austin, TX to discuss the biggest problems and most forward-leaning solutions in the education field. New Profit is extremely excited to be hosting a panel titled "CEO State of Play in Personalized Learning" featuring four amazing social entrepreneurs from our Personalized Learning Initiative, including Dana Borelli-Murray of Highlander Institute, Susan Patrick of iNACOL, Beth Rabbitt of The Learning Accelerator, and Elisabeth Stock of PowerMyLearning. Keep reading to find out where to find other members of the New Profit community during SXSW EDU 2019. The Startup Spotlight is a networking event that spotlights education startups at SXSW EDU. Attendees will have the opportunity to demo products and offer valuable, real-time feedback in a fun and casual atmosphere. Head over to the Austin Convention Center Exhibit Hall 4 Meet Up Pavilion to meet and network with LiftEd, a mobile instructional support platform that empowers special education teachers, related service providers, and other specialists to continuously track student progress, intelligently refine instructional strategies or interventions, and accelerate learning outcomes for students with learning differences or special needs. This panel features New Profit's own Marco Davis, alongside Christopher Emdin from Columbia University Teachers College, Kate Gerson from UnboundEd, and Jeff Livingston from EdSolutions. Every student is unique and learns differently. Variability in culture, socio-economic status, race, gender, ethnicity, and more in higher ed can make teaching overwhelming. Universal Design for Learning is a framework that empowers educators to address multiple barriers to learning through the design of their environments. To build capable, just, and compassionate leaders for our future, we need to create learning opportunities that are rigorous, relevant, inclusive, and accessible to all. How meaningful are SEL programs if they aren’t inclusive of all learners? How do we ensure educators are equipped to support SEL? Explore the unique considerations educators must be aware of when it comes to SEL & supporting students with learning and attention issues like dyslexia & ADHD. Leveraging an equity & inclusion framework, we’ll consider the broad diversity of these students & their needs, including those marginalized for reasons of race, socioeconomic status, gender, or sexuality. This session will help leaders who are struggling to design, launch and scale blended and personalized learning initiatives across a school or district. This session will breakdown Highlander Institute’s Pathway to Personalization Framework, which is a linear process for determining readiness, creating a vision for pilots, launching pilots, evaluating pilots through continuous improvement, and then scaling best practices. Read a recent opinion piece in The 74 penned by Shawn Rubin of Highlander Institute, which gives a preview of his conversation on March 6th - A Personalized Approach to Personalized Learning: How this 5-step Pathway Is Helping Schools and Districts Experiment the Smart Way. We envision a world where all students are engaged in powerful, personalized learning experiences. Meet the leadership at iNACOL and CompetencyWorks to network and share your work in creating next generation learning models. Learn more about engaging with us and addressing issues, promising practices and lessons learned with the largest active community of innovative practitioners and leaders in personalized, competency-based learning.